True silence. The freezing of all sounds. It wasn’t possible in the modern world, to listen to the sound of true silence. Perhaps not even in the ancient world, either: there was wind in the desert; insects in the depths of the forest; wave activity in the middle of the ocean. Nature did not tolerate silence. Only death accepted silence; and there was silence here. 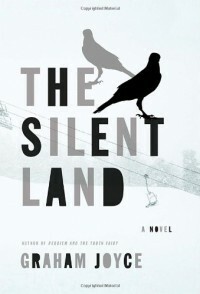 In The Silent World, Graham Joyce’s eighteenth book and 2011 World Fantasy Award and British Fantasy Award nominee, a young couple, Zoe and Jake, on a skiing holiday in the Pyrenees, are caught in an avalanche. Jake frees himself and digs Zoe out. But when they make their way back to their hotel, on the outskirts of Saint-Bernard-en-Haut near the French-Spanish border, everyone is gone, from the slopes, from the hotel, from the town. It does not take long to figure out the main underlying situation here. The author certainly offers plenty of clues. Thankfully, the characters in the story realize it as well in short order, and the rest is figuring out the details, the significance of the sundry events that occur, the meaning of symbols that appear, the messages that intrude into the bubble, the finer points of their dilemma, and how things will turn out for the couple. Where Stephen King used enforced isolation in Under the Dome to look at how a town full of people expose their true selves, Joyce employs a similar external device to contemplate deeper existential concerns with a man and a woman standing in for you and me. Zoe and Jake are in a place where their basic needs are well taken care of, and some exotic ones as well. They face some crucial questions concerning who they are. It was true that they had taken many skiing holidays together and after so many it did become difficult to distinguish some of them; but it disturbed her that he couldn’t remember any of it. Are we more than the sum of our memories? Do we cease to be who we are/were if/when those memories fade? As someone with a rather unreliable internal hard drive, that is a question with resonance. Am I less myself today because bits of my experience have been sloughed off like dry skin? Are you less yourself? Later, worried about Jake’s fade, Zoe offers an alternative. There is fun to be had with this book, and it is a fast read, particularly considering the core existential subject matter. What do the crows on the police car signify? How about the masked men that appear? Or the large black horses? This combination of serious content and surface gamesmanship made this a fascinating read. We may not spare a lot of time thinking about the things that Zoe and Jake confront but maybe we should, if only we could block out all that bloody noise. I suppose one could look at the word Haut in the name of their town where Jane and Zoe stayed two ways. High-class, as in haute cuisine, and there is certainly some good life to be sampled where they are staying, or in the Germanic meaning of Haut, which is skin. In that case they were staying on the surface of things without penetrating to the meat. The St Bernard portion of the town name could relate, I suppose, to an ancient saint, but I prefer to think of it as having to do with rescue. "My grandmother was one of these old women who used to have dreams and visions and messages arriving. She would fall asleep in a chair, there would be a knock on the door, she would go to the door, someone strange would come to the door and deliver a message. And then she would wake up again in her chair. Now my mother and my aunties told me these stories over and over again. But they just lived with it side by side. They didn't fight it as in a fantasy or horror film. They didn't have to overcome it. It didn't get worse and worse and worse. They just accepted this mystery and then they cooked the dinner." Lest one imagine a contemplative nerd, GJ still plays goal for the England Writers Football team.